Tonight (Sat. August 25, 2018) the UFC is in Lincoln, Nebraska from the Pinnacle Bank Arena. 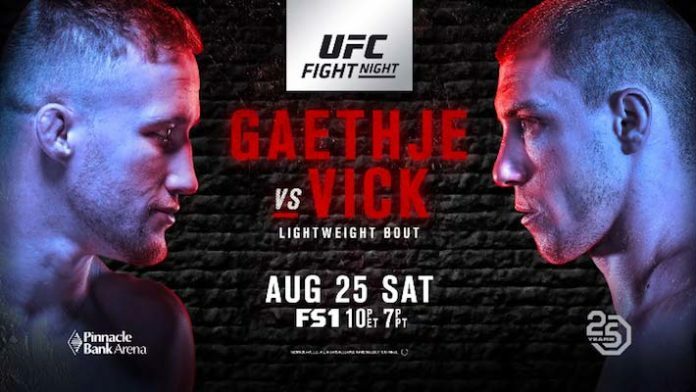 In the main event, lightweights Justin Gaethje and James Vick will go head-to-head. The co-featured bout will see Andre Fili and Michael Johnson collide in a featherweight contest. Also, Mickey Gall will open up the FS2 prelims against George Sullivan. Feint flying knee from Vick starts the round. Gaethje now trying to push forward. Gaethje in close until they separate. Gaethje closes in again and lands a thunderous overhand that right that puts Vick to sleep. That’s a wrap.